Rich, cheesy and textured with polenta, this Greek-style quiche is gluten free and delicious served hot or cold, which makes it perfect for picnics or lunch boxes the next day. It’s an easy recipe that is sure to become a favourite in your home. Heat 2 tablespoons of olive oil in a large frying pan over medium-high heat. Add the spring onion and cook for 1–2 minutes until softened. Using a slotted spoon, transfer to a bowl and set aside. Increase the heat to high, add 1 tablespoon of olive oil to the frying pan with the asparagus and cook for 2 minutes. Transfer the asparagus to the bowl with the onion, reserving the tips to garnish the pie. In a separate bowl whisk the eggs, yoghurt and remaining olive oil until well combined. Whisk in the polenta, then add the cheeses, dill, paprika and the onion and asparagus. Season lightly and stir until combined. Pour the mixture into a greased, 1.75 litre (7 cup) baking dish. 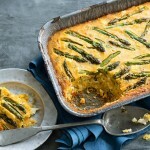 Scatter the asparagus tips over the pie and bake for 40–45 minutes until golden. Remove from the oven and allow to cool for 10 minutes before slicing.